The church of St. Nicholas, is of flint with stone dressing, in the Early English style, and has a tower containing 3 bells; in the transept chapel is a brass, dated 1443, to an esquire in Kent named Halle; the church was restored in 1882 at a cost of about 1,150 pounds. 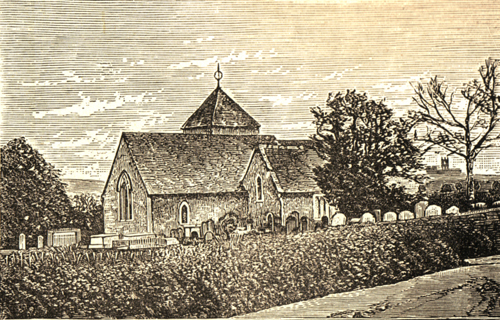 When John TERRY, my 3x great grandfather was 24, he married Eliza HOWARD at the parish church in Thanington on February 24, 1845. Both of them were residing in Thanington according to the wedding certificate. The witnesses at the ceremony were George Penn and Evelina Goodwin. Eliza's father Thomas HOWARD was listed as a Farmer, and John TERRY is noted as a Labourer. Eliza was working as a school mistress in 1841, and was living on King Street in Canterbury with her father, and I believe a sister. John TERRY was also at home in Canterbury at this time, living with his parent's John and Hannah on Orange Street. One of the witnesses, George Penn might have been George Penn the carpenter of Castle Street, he was living rather close to James and Elizabeth Steddy, who were related to John's father. 1889 - Rev. W. H. Holman, M.A. 1917 Services; Sundays 11 and 3:30. Vicar, Rev. M.F.Evans. During the summer, from May to Sept. Service is held in the Milton Church at 6:30.